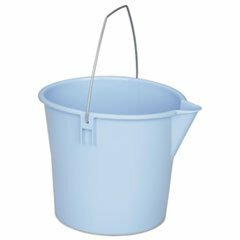 Sturdy utility pail made of low density polyethelene plastic with convenient pour spout for easy dispensing. Gradation markings allow for quick and easy measuring. Easy to transport with strong wire bale handle. Utility Durable enough for use in both hot and cold climates. Capacity Range (Volume): 10 qt; Diameter: 10"; Height: 9.5"; Material(s): Polyethylene.